DNSA is currently made up of 50 different collections, these include ‘Afghanistan: The Making of U.S. Policy, 1973–1990’, ‘China and the United States: From Hostility to Engagement, 1960–1998’, ‘Electronic Surveillance and the National Security Agency: From Shamrock to Snowden’, ‘The Iran-Contra Affair: The Making of a Scandal, 1983–1988’, ‘Terrorism and U.S. Policy, 1968–2002’, ‘The U.S. Intelligence Community After 9/11’, ‘U.S. 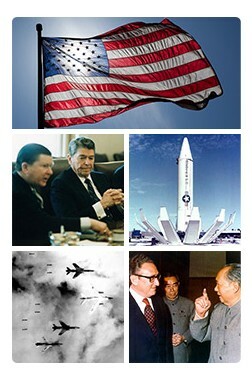 Intelligence on Weapons of Mass Destruction: From World War II to Iraq’, and much more. Please note that the Library has already purchased 7 collections from DNSA, you can find out more about these at Spotlight on Digital National Security Archive and these can be accessed as normal via the Databases A-Z list. When you access DNSA from the E-resources trials page this will take you to a search page that allows you to search through all 50 of the available collections at one time. If you’d rather search an individual collection or just find out more about the individual collections, then under the ‘Included databases’ heading (beneath the search box) click on ‘Show all’. This lists all available collections, the information button next to each collection gives you more information about it and if you click on one of the collections listed it will take you to a search page where you can search that specific collection. ProQuest produced DNSA in partnership with The National Security Archive, a non-profit research institute and library located at The George Washington University in Washington D.C. It provides unprecedented access to declassified government documents obtained through extensive use of the U.S. Freedom of Information Act (FOIA). This entry was posted in Library, New, Online resource, Trial and tagged Africa, Asia, Databases, Europe, History, International Relations, Middle East, Politics, primary source, South America, United States by cstirling. Bookmark the permalink.